Mr Wolf. Mr Shark. Mr Snake. Mr Piranha. Theyre Bad Guys, everybody knows that. They're scary and dangerous and well...just BAD. But these guys want to be HEROES. And they're going to prove it by doing good deeds...whether YOU want them to or not. Buckle up for the funniest, naug... read full description below. Mr Wolf. Mr Shark. Mr Snake. Mr Piranha. Theyre Bad Guys, everybody knows that. They're scary and dangerous and well...just BAD. But these guys want to be HEROES. And they're going to prove it by doing good deeds...whether YOU want them to or not. 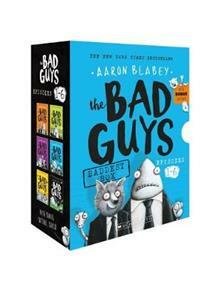 Buckle up for the funniest, naughtiest and coolest SERIES you'll ever readit's time to meet THE BAD GUYS. Includes 10 BONUS TATTOOS inside!